KONTAN.CO.ID - Jakarta. Utilization of internet of things (IoT) technology has driven efficiency and cutting down business processes, so productivity will increase. One logistic and port company that has been utilizing IoT technology is Cikarang Dry Port. 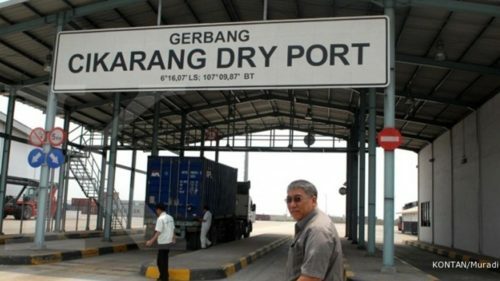 The only land port in Indonesia is claimed to be able to perform efficiencies around 60% -70% and speed up business processes with the utilization of IoT technology.IoT technology is used along with the increase in service volume in Cikarang Dry Port. Mentioned, in the first half of 2018, the volume increase in Cikarang Dry Port reached 27% compared to the same period the previous year. "The port ecosystem involves various parties. Formerly chain communication, now can be done simultaneously with IoT technology. So, once a half-day job, now with a few minutes can be finished. That is what improves efficiency that encourages productivity, "said Managing Director of PT Cikarang Inland Port Benny Woenardi at Asia IoT Business Platform Media Day event at Ritz-Carlton Hotel Jakarta, Wednesday (4/7), as quoted in a release received Kontan.co .id. PT Cikarang Inland Port is a company that manages Cikarang Dry Port. This company, according to Benny, uses IoT technology in the first time for electronic seals . This technology is used to track and improve container safety. After that, the use of IoT develops on smart port and auto gate technology. "In April 2018 also mobile apps have been realized. Later two months in August, we have full epayment and ebilling in our mobile apps (My CDP), "he explained. According to him, when first used, the efficiency impact of the use of IoT is still small, only about 10% -15%. "Well now when compared with the beginning, it's probably already almost 60% -70% efficiency produced," he explained. Cikarang Dry Port is one of 83% business people in Indonesia currently exploring and implementing IoT technology solutions. According to Asia's IoT Business Platform Director Irza Suprapto, Asia's IoT Business Platform survey results in ASEAN last year showed that 11.8% of businesses have implemented IoT and 5.1% have benefited from the implementation. While 29% are exploring IoT solutions and 37% are gathering facts and studying IoT solutions.